The annual IKO Mt. 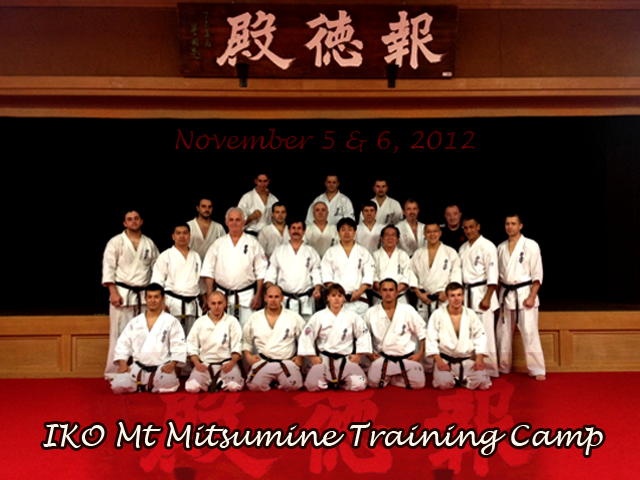 Mitsumine Training Camp was held November 5 & 6, following the 44th All Japan Championships. This year twenty-five (25) members from: Ukraine, Russia, Spain, France, Germany, Singapore, USA, Australia, Poland & Canada attended the 2 day camp. With a fewer number of participants, everyone was able to enjoy the training in a much more relaxed yet intensive environment. After the 4 hour bus trip from Tokyo, all the participants started the camp by paying homage to Sosai Oyama at his memorial site on Mt. Mitsumine. A three (3) hour training session followed and covered many aspects of Kyokushin training. This year, the new IKO Intensive Training Course was started at Mitsumine. This training course is specifically designed to assist those IKO members wishing to grade for 4th Dan and above. Upon return to Tokyo after the camp, the Intensive Training Course will continue at IKO Honbu for 3 more days. At first glance, there were a number of questions about the need for this intensive training, however, upon further reflection, this will give all IKO members the best possible chance to be successful with the grading process at the higher levels. Training the second morning of the camp came early with a 6:00 AM start. Kancho led this class with some basic fighting combinations and great footwork combinations. The class ended with a kumite session for the dan candidates. After breakfast and a final visit to Sosai Oyama's Memorial Shrine the camp ended. The walk-down Mt. Mitsumine for waterfall training was unfortunately cancelled due to the heavy rain that started earlier in the morning. A pleasant ride back to Tokyo saw the end of a very busy past five days. This entry was posted	on Tuesday, November 13th, 2012 at 8:33 am	and is filed under Uncategorized. You can follow any responses to this entry through the RSS 2.0 feed. Both comments and pings are currently closed.